One thing we’d like to bring to our readers is the opportunity to experience the trenches of working professionally. 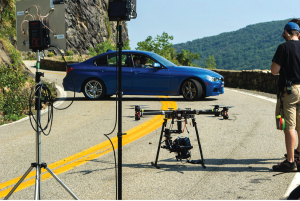 Recently in up state New York, BMW set out to capture the ultimate driving machine, using the ultimate aerial platform. Their goal was to leave viewers thrilled and amazed, and we set out to make that a reality. The night before the shoot, John, my camera operator, and I began with a detailed checklist of equipment needed, and to ensure everything functioned as expected, a quick test flight was performed. This includes every piece of equipment down to the spare FPV monitors and transmitters. Everything must work. We then packed up the gear and began the four hour drive to meet up with the production crew at the hotel. Since John had just finished a job earlier, we didn’t arrive until nearly 1:00am. Call time for the shoot was dawn, as the goal was to catch the beautiful lighting as the sun peeked up over the horizon. When we arrived, John was met by the DP (director of photography) and was handed the Red Epic Cinema camera package. We set up in the hotel room, and as John built the camera and balanced it on the Movi M10 gimbal, I was assembling the arms onto the Gryphon Dynamics 1400mm X8 heavy lift copter. Upon arrival it was still completely dark out. Trucks, generators, tables and equipment littered the base camp. No less than 60 crew members were all running around preparing for a day that would end more than 12 hours later. With the copter built and gimbal ready to go, John and I were given radios to talk on and assigned channels for various sections of the team. With all batteries charged and ready for flight, we calibrated the compass and the director called for a meeting. During this meeting, safety protocols were outlined as well as plans for the day. I did a short introduction and explained to the crew the basics of safety specific to the aerial copter. With iPhones recording everywhere, we performed a hover test and some basic movements successfully. The site for the shot was a beautiful state park in NY with a classic winding road along its perimeter. The road overlooked the Hudson River, and the elevation to the water was at least 700 feet. What an epic location for this commercial. The stars on set today consisted of three brand new BMW 3 series sedans of various colors. Each was immaculate. A team of detailers kept each vehicle in showroom condition. The production team was divided into two teams. 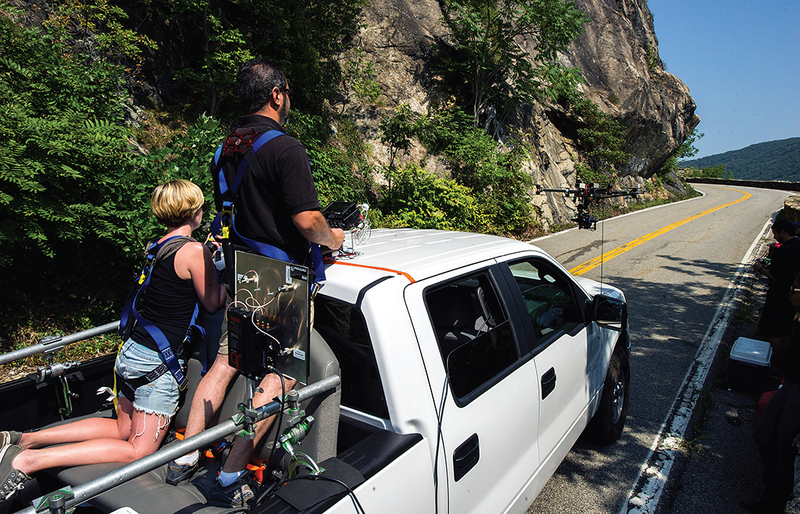 One team stayed behind to rig a vehicle with various camera mounts for tight close-up ground shots while the other team assisted in aerial capture. One thing that separates the real production companies from the rest is planning. The team asked that we accompany them on a scout day to review each location along the mountain as well as the intended shot they needed to obtain. Every single shot they needed was predetermined and decided. This is a relief as I am far too accustomed to the wide eyed stare I get from some directors as they ponder the possibilities once in front of the machine. It can be frustrating to be hovering while the director runs back and forth yelling, “Can you try this? Wow, how about that?” Since this was delightfully not the case today, I knew exactly what I would need to accomplish, days before I even arrived. Due to the fact that these multirotors are still brand new to most looking to hire us, it was nice to share our experience and input on what shots were feasible, and how some could be modified to add an additional margin of safety. When you’re flying with $150,000 worth of equipment in the air, you want to take every possible precaution to ensure everything is done right the first time. One of the most exciting shots of the day was definitely the one where we play chicken with the car. 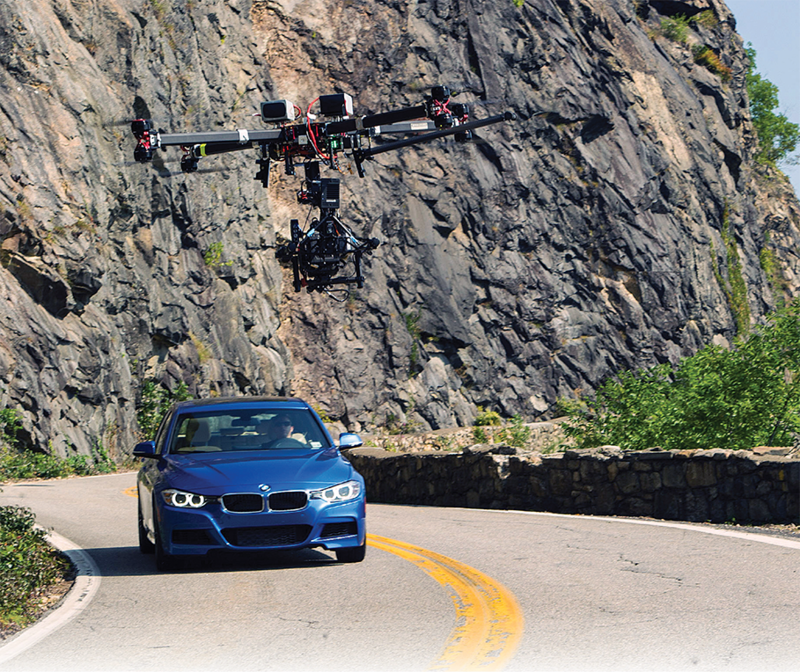 The story of the commercial was to clearly make it known that a drone was used to film it, but the goal was to show that the copter couldn’t keep up with the BMW. If you get a little white knuckled thinking about flying an expensive rig, this one will make you sweat. For this shot I was harnessed into the back of a truck. To my left was an assistant on the radio to rely any emergency communication from me to the director, DP and drivers should something go wrong. It also helps me to communicate hands free. The BMW was positioned a quarter- mile up the winding road and around the corner. 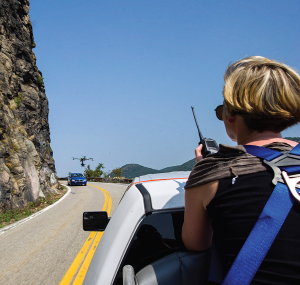 The premise for this shot was for the copter to fly as fast and as low as possible toward the car. Since the road was winding with a cliff on the right and a granite rock wall on the left , this shot was a bit dangerous. To ensure I could maintain clear sight of the copter, a chase vehicle was used to keep me as close as possible. As the road twisted, the copter would alternate between being three feet over the road to 700 feet above the water. At the last moment I would end on a collision course with the speeding BMW, and would pull up in the nick of time. To get this shot takes a symphony of coordination between not just me and John, but the driver of the chase vehicle, the stunt driver and finally the production crew. The copter and the car had to meet exactly at the right place on the road, and it took several attempts for the BMW stunt driver to time it correctly. During playback, everyone was ecstatic at capturing a shot that couldn’t have been done any other way and brought a new perspective on car filming. I n total, over 20 planned shots were executed at various positions along this mountain. All were combinations of very low and fast chase or follow sequences followed by aerial maneuvers to trick the viewer into wondering how the shots were captured. Many appear to start as a Russian arm, but turn into aerial. In all, over the course of two days we flew over 50 flights in order to capture each and every shot they had planned in all their glory. The commercial is expected to be released soon and we will post it on the Multirotor Pilot magazine website and Facebook page. When the shoot finally wrapped, John and I congratulated each other and recounted the adrenaline and excitement of the past couple of days. There were times when the beating sun and the mental fatigue of flying left me grasping for the last bit of strength in my body. We were pushed many times beyond what was comfortable, but it forges a new level of confidence in what we can do. What was once inconceivable is now effortless. Every obstacle or problem encountered is a valuable lesson learned. I truly hope that my experience can somehow help you to grow and realize your dream and make it big!